M. Andrew Holowchak, Ph.D., is a philosopher and historian, editor of "The Journal of Thomas Jefferson's Life and Times," and author/editor of 11 books and of over 80 published essays on Thomas Jefferson. He can be reached through his website. I was very excited to obtain a copy of this book from a good friend for three reasons. First, he had told me that the authors offered a different, sober take on Jefferson’s Notes. Second, Jefferson’s Notes, when read from cover to cover, tells us much about the mind of the man and I am always intrigued to read scholarly literature on it. Last, like Gish and Klinghard, I too believe that the Notes is greatly misapprehended by most scholars. The authors begin with what they dub the “Compilation View”—that there is no real structure to the book and that each query can be read independently of the others as if each were an entry in an encyclopedia. “It is held by most to be merely a compilation of disconnected, if erudite, reflections, observations, and eccentric details, which together convey an attentive mind or perhaps a spirit, but not a coherent thesis.” Jefferson himself, they add, is perhaps largely responsible for that reading. “At no point,” they say, “does Jefferson lay out a thesis or state explicitly some common purpose that would unite the whole.” They then point to his “Advertisement” at the beginning of the 1787 edition. Jefferson writes: “The subjects are all treated imperfectly; some scarcely touched on. To apologize for this by developing the circumstances of the time and place of their composition, would be to open wounds which have already bled enough.” They take the advertisement merely as another instance of Jefferson’s “mock modesty.” In short, the Compilation View misleads and seems tenable only when seeing the surface of the Notes. They promise to penetrate beyond the surface. Gish and Klinghard assert that “a proper understanding of the composition and publication histories of the book is essential to grasping its contents and purpose.” On their reading, the Notes is a sort of political manifesto that Jefferson eagerly wished to get into the hands of “the men who were debating the Constitution of 1787.” That is, according to the authors, the only way to make sense of Jefferson’s urgency in wishing to see it get published and see it in the hands of political colleagues in the States. Here I point out a composition fallacy. Certain parts of Jefferson’s Notesare largely and poignantly political and they are right to see Jefferson’s urgency vis-à-vis publication and distribution of the book as his desire to make some political contribution—“Jefferson had political ambitions for the book”—to the constitutional debate. However, does that make the book as a whole a political work? They assert, “We believe that the Notesshould be read as an effort to shape American constitutional thinking.” What large and poignant claims is Jefferson making in the naturalistic queries—viz., Queries I through VII—of the book? Some queries, like Jefferson’s refutation of Buffon in Query VI, may be politically motivated, but there are degrees of political motivation, and I suspect that his refutation of Buffon was at least equally the criticism that one scientist, genuinely interested in truth, affords another. In defending their thesis, Gish and Klinghard, it must be said, have thoroughly scoured the secondary literature on the Notes. What precisely is that unified literary structure? There are important biographical insights and Jefferson does write in two queries on slavery, but how do those observations give the book unified literary structure? Yet the authors say earlier, “The book need not have a literary structure to be about something, or to convey an important message.” The disjunctive claim is either simplistically and uninterestingly true—Sterne’s Tristram Shandy offers a shining illustration, as there is no literary structure and there are many important messages in it, mostly of a moral sort, but it is about something, here someone, Tristram Shandy—or it is contradictory—that is, the authors are stating that the book need not have a literary structure to have a literary structure. Following William Scheick, the authors argue that Jefferson offers throughout the book a vision of the “tension between order and chaos, or in Scheick’s words, “temperate liberty”—“a delicate balance between stringent order and unrestricted freedom.” That tack seems promising, but does it exist throughout the book? Is it evident in Jefferson’s list of medicinal, esculent, ornamental, and useful vegetables limned in Query VI? Query III, on sea-ports, consists of one sentence. “Having no ports but our rivers and creeks, this Query has been answered under the preceding one.” There is no tension there. Jefferson is merely answering succinctly a question. I could list many other illustrations, but I need not. 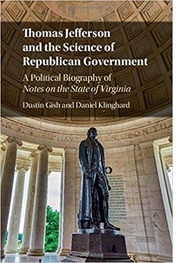 Gish and Klinghard insist that the book is “Jefferson’s most sustained effort to outline a coherent vision of republican constitutionalism.” That claim might be true, yet even if true, it is misleading. The book might contain an outline of a coherent vision of republicanism, but it is much more than that, as that vision is not threaded throughout the book. There is first a biblical parallel. Investigation of the natural, social, and political structure of Virginia is a format that “mimics the order and substantive concerns of the Pentateuch.” Here Jefferson is cleverly aiming “to supplant the authority of the Old Testament.” The God of nature replaces the God of revelation. There is next “engagement with the natural historical methods of the Enlightenment” through the Bacon-inspired Encyclopédie. That Encyclopédie “suggested to Jefferson a means for ordering his Notes as well as an end far beyond the limited goals implied in Marbois’s questionnaire.” Here the authors are likely right, but how does that give the Notes thematic unity? That tends to support one version of the Compilation thesis—that the varied queries, like entrees in an encyclopedia, can be read independently of each other. The authors admit a difficulty. The two motifs “appear contradictory or incongruous, but they note that “Jefferson reconciled sometimes conflicting elements and knit them together.” The reply to the difficulty is unavailing. The incongruousness of the two motifs argues largely against their thesis. Yet in addition to religion and science, there is a third motif: “current political issues in American life.” Jefferson, they note, often referred to republican constitutionalism as an experiment. In doing so, political theory, like science, can be progressive, or retrogressive. They sum, “Jefferson’s Notesthus offers readers a sustained and yet subtle critique of three distinct forms of authority: religious, scientific, and political.” Essentially a political work, it uses religion, science, and politics to advance its political thesis. First, their notion that political theory is much like science treats politics as a discipline that is independent of science. Jefferson saw politics, and morality as sciences—something that could be put to the test of reason—not disciplines unscientific. Thus, Gish and Klinghard come to the Noteswith a modern apprehension of the differences between science and politics. Moreover, that republican constitutionalism should be expressed as another, third motif is strange. In other places and as the title of the book implies, the book is essentiallyabout republican constitutionalism. If so, republican constitutionalism cannot merely be a motif that appears in parts of the book and disappears in other parts of it. The thesis tantalizes, and that is just what is wrong with it. If it is true, then Jefferson was Nietzsche before Nietzsche came along. Jefferson’s Notes, then,must be read like Nietzsche’s Thus Spake Zarathustra, a book which unsubtly was crafted to replace the Bible. The only difference is that Jefferson’s Notesis subtle, not unsubtle. That is why so very many scholars have failed to see what Gish and Klinghard see. Nonetheless, Jefferson did not write subtly—that is, to tantalize. His sentences and his writings were not cryptic messages with layers of meaning. He abhorred that sort of writing and he thought little of the Old Testament. One has only to revisit his account of the Old Testament in his Syllabus. Of a clear, scientific bent in the manner of Bacon and Newton—even clearer, as even Bacon and Newton could tantalize, as consideration of Bacon’s four idols and of Newton’s keen interest in occultism and alchemy later in life show—Jefferson was incapable of tantalizing. Even his billet doux to Maria Cosway fails to tantalize. The problem with their thesis is that it is generated by embracing fallacious black-and-white thinking. Either the work has literary structure or it is a “disorganized work”—“a strange and muddled book.” The book lacks literary structure—there is no one thread through the whole of the book—but it is not disorganized and muddled. It begins with phusisand ends with nomos—that is nature and culture. It is crafted to be a scientific work for a scientific audience, but Jefferson, as the authors note, comes to see it can be of use in expressing his own political sentiments on republican governing when the right queries are read and assimilated, and aims to put it into the right hands. Yet that use too is scientific, for politics for Jefferson is also a science, and thus it needs to be studied like any other science. Should there be merit in his republican views, they too can be put to the test of reason. There are two prodigious difficulties, both of which reduce to the tendency to support claims with garbled, uncogent arguments. First, there are a large number of references to the secondary literature and those citations are routinely used to support strained claims in strained ways. Most of those strained claims are introduced by qualifiers such as “one might also see,” “something like,” “it seems like,” “it is possible,” and “it may be.” I offer two instances, though I could offer many. They write of Jefferson’s reference to mines in Query VI. “As Michael Gaudio points out, the language of mining was linked to the new approach to science unleashed by Bacon, who ‘significantly chose mining as a metaphor for the gathering of fact.’ The remainder of the query … marks out an ironic ‘mine’ through which individuals might pursue the drudgery of empirical science.” Jefferson’s account of mining at the beginning of Query VI is for the sake of discussion of the gold, lead, copper, marble and other minerals and stones to be found in Virginia. He is notwaxing metaphorical. Again, they say that Jefferson’s emotive language in describing his passage of the Natural Bridge in Query V is explained, following Zuckert, as “a natural theology of order and final cause.” Anyone familiar with the aesthetical literature that Jefferson read and assimilated will know that Jefferson is merely stating that beneath the veneer of what seems large and fearful from one perspective—“it is impossible for the emotions, arising from the sublime,” says Jefferson, “to be felt beyond what they are here”—there is a beauty that is accessible and lovely—“so beautiful and arch, so elevated, so light, and springing, as it were, up to heaven.” Jefferson is merely stating, following Burke and Kames, that there is both sublimity and beauty in nature. The authors read in political intent. There is none. The authors are clearly not studied in the aesthetical literature that Jefferson read. Second, the authors assert that Jefferson had his own methodological approach to science—“Jefferson demonstrated a distinctive scientific method,” a “cautious philosophy,” or “methodological skepticism”—that was influenced much by Bacon. Yet while Bacon’s science moved to “absolute certainty,” they say, Jefferson moves to “wonder born in skepticism but nourished by careful observation.” Their Jefferson seems fixated on uncertainty, not knowledge, and that is an impossible reading. One exception to Jefferson’s skepticism is his posit of “that rule of philosophy, which teaches us to ascribe like effects to like causes.” Gish and Klinghard astonishingly fail to realize that Jefferson is here borrowing from Newton’s “Rules of Reasoning in Philosophy” in his Principia Mathematica: “To the same natural effects we must, as far as possible, assign the same causes.” Yet Newton, too, borrows the principle from Greek antiquity, as the principle can be found in Aristotle’s and the Hippocratic writings. The authors say relatively nothing about the methodological influence of Newton on Jefferson in the Notes, and that influence is large. It is clear that they have not read the Principia. Moreover, references to Baconian methodology almost always come from the secondary literature, not from Bacon. One has to ask this: Have the authors, who often cite Bacon, read him? When they make claims related to scientific methodology, they show extraordinary naïveté of scientific methodology and its history—a history that had roots in Greek antiquity and that is a point of which the authors seem to be unaware. In crafting numerous claims about Jefferson’s approach to science—most of which are false—their ignorance of history and philosophy of science becomes manifest. They claim, for instance, that Jefferson’s three tables of animals perfectly fit Bacon’s “tables of instances” in his New Organon.Bacon’s tables comprise an empirical method for ascertaining causes. For instance, to support the claim that living in Americais a cause of diminished bulk in animals, one would study all animals in America and compare them to similar animals in Europe. One should find through table one that animals in America are diminished, through table two that animals in Europe are larger, and through table three, the degrees of difference in bulk to ascertain the causal force of living in America and diminution of bulk. “This is precisely the method Jefferson uses,” they assert, “to assess the effect of the climate of Virginia and Europe.” Yet Jefferson’s second table is a list of animals that are aboriginal—unique to America and unique to Europe. How then can Jefferson be precisely using Bacon’s three tables? To sum up, the book aims to show that the received view, the Compilation View, is false and to supplant it with a more nuanced view. The book fails to convince because their Compilation View is a poor expression of what the majority of scholars think of the work—i.e., they have constructed a straw man. Moreover, they replace the received view with another, political view, based on questionable claims, “supported” by quixotic arguments and a metaphorical reading of text, which is meant to be read literally. I strongly recommend that scholars steer clear of this book, because they offer a complex and impossible reading of Jefferson’s book. I suspect serious scholars might leave off before finishing the book.